Riding 390 miles in 4.5 days is no easy feat, especially when it includes 27,400 feet of climbing. And especially when you do it on a Brompton. When asked why he decided to come on a Brompton, he explains that he broke the frame on his previous bike and never really got around to fixing it properly. He bought odd bits here and there but ended up just riding the Brompton for 10 years, both as a commuting bike and as a touring bike on various international trips. At the start line Guy was met with amusement and before the ride his plans were met with a mixture of fascination and sympathy. “You can always back out and do it on a proper bike,” he was told – “no pride lost”. But such appeals merely cemented his resolve to complete the ride with his faithful, collapsible steed. And though he admits it was gruelling at the time he maintains that it was an enjoyable and rewarding ride, adding “you always forget the hard bits after a while”. There are some differences between the two riding styles which Guy is definitely qualified to comment on. 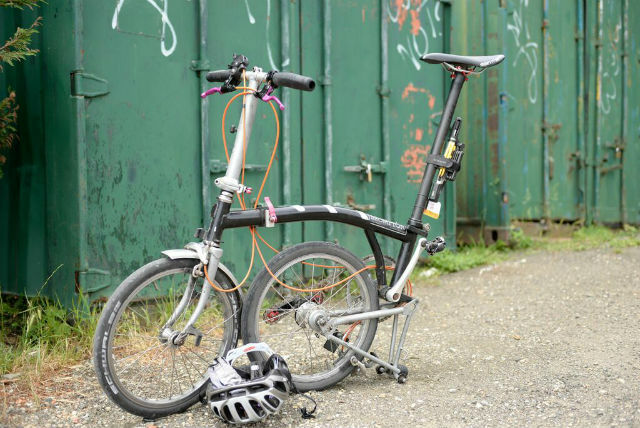 “The Brompton is compact and jittery, but fun. It’s very nimble and turns on a sixpence”, he says. It also feels surprisingly secure on downhill sections “because the wheels are smaller there is a lower centre of gravity”. Guy candidly revealed his tactics when asked how he tried to minimise the suffering during the ride: “you tuck in behind friends and buy them some beers at the end of the day”, which was useful on flat sections (“they’re especially trying on a Brompton!”). It wasn’t all smooth riding though – Guy had two small blips during the ride. The first was when he misjudged a corner and went into a ditch, as despite what he said earlier about the smaller turning circle being more comforting on a Brompton, his brakes weren’t up to scratch. The second was when the wheel began to wobble on a cobbled section, and he was unable to steady it before falling off (and falling into Ride25 co-founder Rob!). After picking himself up and dusting himself (and the bike) off, Guy was back on the road. Of the Brompton he says “it’s a massively robust bike: I’ve done nothing to it in 10 or so years apart from changing tires and minor repairs and it’s still going strong.” Hopefully that means it’ll still be standing for many more Ride25 legs to come! We also asked about Guy’s preparations for the ride in case any readers are inspired to follow suit, and his top tip is “train, train and train!”. He made sure to do training rides at least equal in distance to the leg’s average daily mileage (86 miles a day, if you’re wondering). He also said to definitely think about bio-dynamics and get used to the different riding style beforehand, so you don’t get caught out with any unexpected aches and pains on the ride. And most importantly, “have fun!”. Guy’s future plans are equally impressive: he and some friends are hatching a plan to do a ride in the style of a Top Gear challenge. The rules will be to spend less than £100 on a bike, ride at least 1 sportive before the next Ride25 leg, possibly do that leg on the bike too, then sell the bikes and donate all proceeds to 1 More Child. Typically modest responses from Guy. What he didn’t tell you was that he was still one of the fastest in the group (we drafted behind him) and he decided to run a marathon for One More Child on the last morning before catching the plane home! He’s a nutter, but that’s the beauty of Ride25. Literally anyone can get involved. Super human or mere mortal up for an adventure.